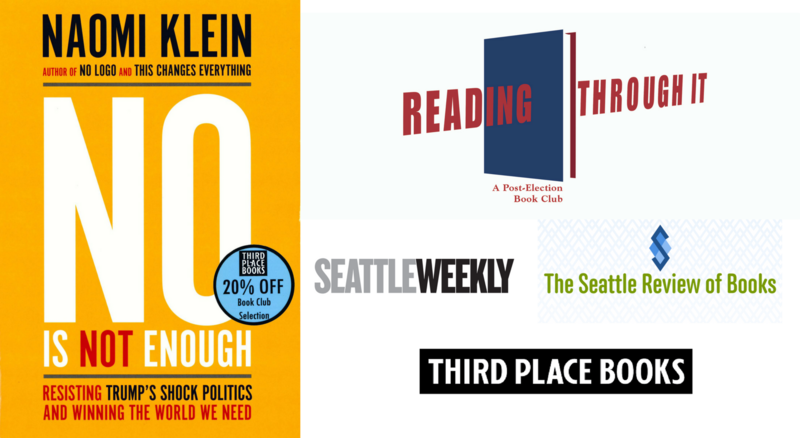 The Seattle Review of Books, Seattle Weekly, and Third Place Books Seward Park continue our book club exploring who we are as Americans, where we're going, and how we might fix our greatest problems. Reading Through It meets on the first Wednesday of every month. Donald Trump's takeover of the White House is a dangerous escalation in a world of cascading crises. His reckless agenda--including a corporate coup in government, aggressive scapegoating and warmongering, and sweeping aside climate science to set off a fossil fuel frenzy--will generate waves of disasters and shocks to the economy, national security, and the environment. Acclaimed journalist, activist, and bestselling author Naomi Klein has spent two decades studying political shocks, climate change, and "brand bullies." From this unique perspective, she argues that Trump is not an aberration but a logical extension of the worst, most dangerous trends of the past half-century--the very conditions that have unleashed a rising tide of white nationalism the world over. It is not enough, she tells us, to merely resist, to say "no." Our historical moment demands more: a credible and inspiring "yes," a roadmap to reclaiming the populist ground from those who would divide us--one that sets a bold course for winning the fair and caring world we want and need. This timely, urgent book from one of our most influential thinkers offers a bracing positive shock of its own, helping us understand just how we got here, and how we can, collectively, come together and heal. Drink and food specials are available from Raconteur during book clubs, so grab a glass and join us for a lively literary discussion. Every month our selected titles are discounted 20% through the date of the book club. All are welcome, no purchase required.